Two Bears Farm and the Three Cubs: Upcoming Blogiversary and a Holiday Giveaway! Upcoming Blogiversary and a Holiday Giveaway! Wow, it's hard to believe my one year blogging anniversary is coming up on Saturday. Of course, we must celebrate! So it must be time for a giveaway. Up for grabs - it's all holiday goodies- and I pledge to ship them right away so you'll have them before Christmas. Unless you live in another country. Then I promise to do my best. The winner will get a Bake and Build Gingerbread House book and kit. It comes with cookie cutters, a plastic wreath and snowman for decor, pastry bags, and a book to tell you all the fun ways to go about building your house. 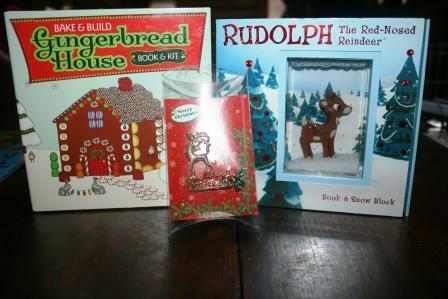 Also included is a Rudolph the Red Nosed Reindeer boardbook and snow block. The snow block is like a snow globe - only it's a block with Rudolph inside and lots of snow. Finally, a very festive reindeer pin. Okay, so to enter. For the first time I am requiring that all those who enter be a follower of my blog. Why? Because I want to give back to my followers, who have hung out with me here in my blogging adventure. If you want to enter but aren't a follower, it's not too late to become one. Once you're a follower, enter by leaving me a comment of what you'd like for Christmas. I will use Random.org to choose a winner. The giveaway closes on Friday at 2:00 pm. I'll announce the winner Saturday December 11th, on my actual 1 year blogiversary. I'll enter! I just thought to myself yesterday that we have to buy a gingerbread house soon so we can ice it and lick the icing! :) Happy almost blogiversary! I'm happy to have met you through this fun blog-adventure!! What a great giveaway! I love it! Hmmm for Christmas I personally would love like a gift certificate to foodnetwork.com. I love Racheal Ray's new cookware. I like her pots and pans and also her baking stoneware. I love all of the colors! What I'd really like for Christmas this year is a chance to spend time with family - hopefully, that's just what I'll get! I think this is a fun giveaway! And for Christmas, I want something that I DON'T have to buy. Sadly, this is hard to get! Sounds fun, especially the gingerbread house! What do I want for Christmas? A non-contingent contract on our house in Waynesboro!!! These would be so wonderful to build and explore with. Congrats on your anniversary! What do I want for Christmas? A iPhone!!! Congratulations! I am now an official Google follower! :) For Christmas I just want everyone to get a long, but since that probably won't happen I'll take a kiss instead! what a fun giveaway! I love Christmas time! What I really want for Christmas is time spent with my family! Last year, we were literally snowed in and what fun it was!!! Congrats on your almost 1 year anniversary!! It goes fast huh? I've never done a ginger bread house so that would be fun!! All I want for Christmas is to spend some time with family, enjoying some good old stories and lounging around! I will love to see Mad open all her gifts too! That is more enjoyable than getting anything for myself! Congratulations~! One year of blogging is a great accomplishment.. I never got really serious until this year.. I'm so glad I did I have met a lot of cool bloggers.. I'm a new follower! Great giveaway! I'm sure my kids would love it. I want a Nook for Christmas. I considered one last year but decided I didn't want to have to buy books all the time. But now my library lends ebooks so I'm getting the Nook! CONGRATS on the 1 yr of blogging, that same day is the 15 yr anniversary of my husband & I. I would love a spa day for christmas..just to relax & prepare for another year. 1 year, congrats! I'm new here, looking forward to getting to know you more. What a great giveaway! I am a new follower. ;-) I would love a book light for Christmas. Congratulations! So many bloggers come and go long before the 1st year is up. It's been great getting to know you and going on virtual marathons with you. Please enter me for the giveaway. I would love to win it for Christmas. We love Rudolf and gingerbread houses here.